Weeds can often be found growing in bonsai pots. Not only are they unsightly but their removal is necessary as they take away valuable moisture, nutrients and soil from the bonsai. Weeds can easily find make their way into the pot; weed seeds are often blown by the wind onto the surface of the soil. Weeds themselves or their seeds can also be present in the soil that is used at repotting time, particularly if organic soil components such as leaf mould, bark or sphagnum moss are used. 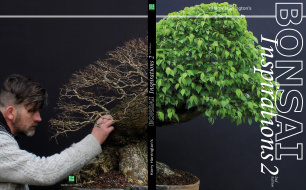 But how is the best way to remove the weeds from the soil of the bonsai? Ideally, weeding should be carried out by hand as and when any weeds emerge. If a weed becomes established in the pot, it's roots can quickly become entangled with those of the bonsai. Pulling the weed out can then become hazardous to the bonsai itself if too much force is used; the entangled roots of the weed and the bonsai can damage those of the bonsai. The structure of the soil can also be disturbed, the removed weed roots may also take some of the soil with them, leaving voids and airpockets within the bonsai pot. Complete removal of an established weed during the growing season is difficult to carry out without causing damage to the bonsai. Unfortunately without complete removal of the entire weed rootsystem, many weed species are able to regenerate and very possibly reappear at a later date. A common way of removing weeds is to use a herbicide/weedkiller. These are intended to kill the weed by entering the green tissues of the leaves, the weedkiller then travels within the weed until it enters the roots, upon which it disturbs rootgrowth and root activity. The weed may therefore take a number of days or weeks to die but with it's rootsystem rendered ineffective, there is little chance of recovery or regeneration. Glyphosate and RoundUp are probably the best known and most widely used weedkillers for amateur use in Europe and the USA. It is well known that on application, great care must be taken that glyphosate/RoundUp should only come into contact with the leaves and green immature shoots of a weed; contact with the bonsai will similarly kill the bonsai. Glyphosate/RoundUp entering the soil via run off or within the weed-roots should (and normally does) become absorbed into the soil particles and is quickly degraded by micro-organisms in the soil.